Dr. Michael Habib of Chatham University, who along with Justin Hall blogs at H2VP, recently delivered a talk at the Royal Tyrrell Museum as part of their 2012 speaker series. Titled "Air Giants: Launch, flight, and ecology of Cretaceous pterosaurs," it is an hour of pure pterosaurian indulgence, an overview of pterosaur science that clears up many misconceptions the public has about these awesome creatures. Posted below for your viewing pleasure. Dig that he took a moment to thank the artists whose work he used in the presentation! Extra props as well to the Royal Tyrrell for their super-cool interactive geological timeline on their main page. When visiting secondhand stores and browsing for dinosaur books, I buy less than I find. Often, books just aren't interesting enough to bother with. On a recent trip to a Goodwill store, I found a book that may have originally come with a Hot Wheels race track, filled as it was with Hot Wheels cars being victimized in various ways by prehistoric beasts. We often note that we don't blame illustrators for dinosaur art that is less than accurate. They're being paid to do a job, and probably don't have the luxury of fussing over details and corresponding with paleontologists. This book was the perfect example; whoever wrote it couldn't even be bothered to distinguish the animals from each other, calling each one "dinosaur." Which lead to this unfortunate page of fail. Beyond the fact that it's sadly called a dinosaur, there's so much wrong here. The bizarre crest! The teeth! The outlandishly exaggerated scale! The gross wingy tendony things! The rest of the book couldn't quite match this level of doublefacepalmitude, but I had to snap a quick photo of this one. Got to admit though, the dinosaur-themed Hot Wheels tracks look more fun than a barrel of anurognathids. I realise that I've been very light on the content recently and I can only apologise. Please, accept this gift of a book cover of such flabbergasting wrongness that you won't sleep well for several nights. Because it'll haunt you. Its toothy grin and flouncing posture will lurk in the darkest recesses of your bedroom. You won't be able to see it, but it'll be there...waiting. And hey, Niroot had a good idea recently - a caption competition! Please, devise the best captions for the dancing dinosaur above, and the winner will receive fame beyond the wildest dreams of anyone ever mentioned on some blog about dinosaurs. Sometimes I'll see a piece of the advertising flotsam that clutters the modern web and wonder what the person behind it was thinking. Was this targeted at me because of my browser history? If I was a construction equipment buff would the characters be little backhoes and earthmovers? Or maybe the site just arbitrarily chose to stick little dinosaurs on its advertising for no real reason, with no relationship to the copy. Not even a "Don't go extinct! Get your degree!" Just weird. I would be remiss not to post this. Electronic musician John Boswell is back with another video in his popular Symphony of Science series, this time dedicating a song to the dinosaurs. I'm going to have that "the world of the dinosaurs" bit stuck in my head for days. During a recent jaunt to San Francisco, Jennie and I visited the California Academy of Sciences, nestled in Golden Gate Park. The entry is dominated by a cast of a mid-size Tyrannosaurus rex, which unfortunately isn't much more than a decoration. The provenance of the fossil casts isn't given. In my limited expertise I'd guess this is a teenage individual. The Academy of Sciences holds one other dinosaur mount, in the form of the recently extinct avian theropod Aepyornis maximus, the famed "elephant bird" of Madagascar. A. maximus is mounted within the Academy's impressive evolution exhibit, which focuses on islands as venues for evolution. Therefore, the rationale for its inclusion is as an example of the island rule, and there really isn't anything specific to the dinosaur-bird transition here. I can understand why: this is clearly meant to give the lay audience a good, graspable, visual evolutionary concept - how the isolation of islands makes them perfect places to study macroevolution. I'd love to see an entire hall devoted to the evidence for the theropod - bird transition, but that's not the point of the exhibit at the CAS, and it's stronger for its clear narrative. The highlight of our visit was the enormous terrarium of the Rainforests of the World exhibit, which had its fair share of extant theropods. They provide a great opportunity for photographers, as they aren't too bashful. Blue-necked Tanager. Photo by me. Saffron Finch. Photo by me. Red-Legged Honeycreeper. Photo by me. Two beautiful Blue-and-Gold Macaws, Ara ararauna, also live there, but I was one of the few people who took the Academy's "no photography" signs to heart (you can see a photo or two at the Academy's rain forest blog). Leaving the rainforest but keepking with the theme of extant theropods, the most inconspicuous yet utterly fascinating specimen I saw had to be this mounted Barn Owl wing. The wing was set just inside one of those big windows through which visitors can watch Real Live Scientists do Real Live Science (I'd love to see a giant vacuum valve water bottle in one of these). Sitting on a little table, the Barn Owl wing didn't attract much attention. It certainly wasn't on any brochure or promotional item I saw before the visit. But that's one of the joys of visiting a museum: tucked between the blockbuster attractions that attract the crowds, the attentive visitor can find unexpected windows into entire worlds. This week's dip into the great swirling sea of paleoart past brings José Olivier into the "family." He seems to be a particularly obscure illustrator, which is a shame: his work is so dramatic and fun. It's definitely in the mold of Burian, but not slavishly so. The book these come from, the German publication of Michel Cuisin's Prehistoric Life, was published in the early eighties. There's not much information available on either Cuisin or Olivier, but as Cusin has been publishing since the seventies, I'll have to work on the assumption that Olivier's work comes from that time. These were shared with the Vintage Dinosaur Art pool by geoblogger David Bressan, who also shared images I wrote about in December. First up is a tranquil scene of ceratopsian bliss, as a Triceratops pair takes a rare break from their usual schedule of battling Tyrannosaurus after Tyrannosaurus. The proud tribe of sauropods are represented here by that old standby Diplodocus, in a composition reminiscent of the ever-popular How and Why Book of Dinosaurs (thanks to Niroot for helping me figure out the classic image I was thinking of, after mistakenly believing it was a Knight illo). These Diplodocus bear necks with next to no musculature, an effect which is taken to its inevitable conclusion in this version of another LITC favorite meme, theropods chowing down on sauropod necks as the poor herbivores watch on in horror. I love how the tyrannosaur seems to be popping up straight out of the ground, like a jack-in-the-box. ...and this woeful Pteranodon, who has sustained a terrible rip to his wing and plummets to the unforgiving Earth below. I love how the backgrounds in these eschew the antediluvian fecundity of so many other Mesozoic landscapes, favoring great glowering monoliths and stormy skies. There's something to be said for this moody, monochrome take on the Mesozoic; while it may have been overdone back in the stupid and swampbound days of yore, there's just something so right about the pairing of titanic dinosaurs and pterosaurs with menacing gloom (my favorite example of this off the top of my head is Skrepnick's Centrosaurus herd). 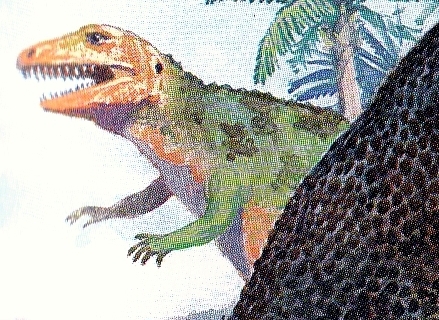 When I first saw the Flickr thumbnail of this next one, I thought for a split second that it would be Pachycephalosaurus. Then I realized that it's just an especially dome-headed T. rex. "Olivier deserves two thumbs up for this two-fingered rexy," said the hack movie critic watching over my shoulder as I wrote this. I agree, though I would never say it in such a goofy way. I can't help but save especially silly illustrations for last. It's a crutch, what can I say. I can avoid wrestling with a summary paragraph and leave you instead with something like this: Allosaurus and Iguanodon, tearing up the Jurassic dance floor. Such a joyous scene. This is what it was like in Eden, before Eve ate that stupid piece of fruit and carnivory happened. Thanks for sharing these with us, David! Okay. Take two, since the blogger widget for android is weird and compresses uploaded images beyond all recognition. I came across this work of poetical genius in Chicago's pedway. Apparently, the work of a third grader. First published in 1984 (with this edition appearing in 1987), the Pocket Book of Dinosaurs from Kingfisher (and Michael Benton) is one of those A-Z 'dino dictionaries' that were seemingly so commonplace back in the day - so much so that, when Thomas Holtz sat down to write a dinosaur encyclopaedia back in 2001, he declared (or so we're told) that "THE WORLD DOESN'T NEED ANOTHER A-TO-Z LIST OF DINOSAURS!" Equally typically, it is awash with bland, samey illustrations of dinosaurs standing around, not doing much. 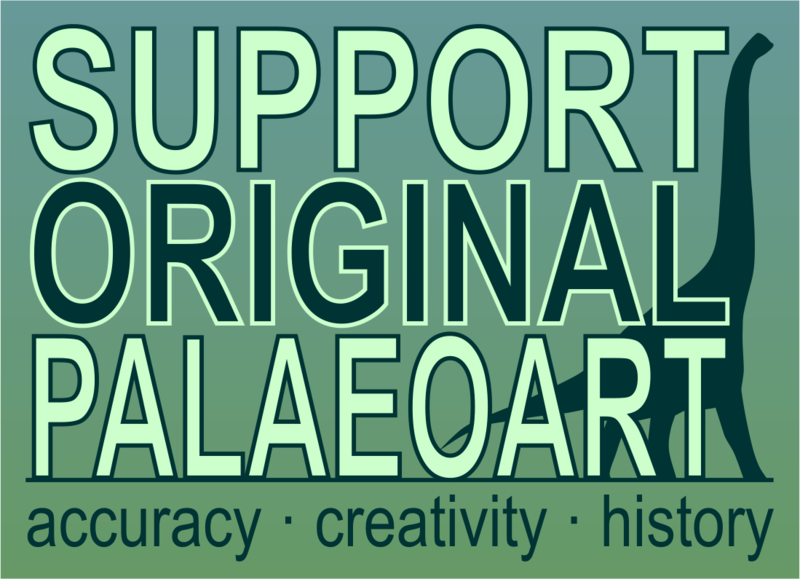 As always, though, the 1980s can be relied upon to provide at least some interesting material, especially when one considers how the artwork fits into the long timeline of palaeoart. By far the best artwork in this book is provided by Bernard Robinson, whose work I've looked at before. The cover is another fine example that plays to Robinson's greatest strength - creating touchably real scaly skin textures. Robinson's dinosaurs may be scientifically obsolete now, but it's hard not to admire him as an animal artist. Inside, Robinson provides some Mesozoic panoramas that perfectly capture the often awkward collision of old and new ideas that occurred in palaeoart at the time. The first one, depicting the late Triassic, is actually very modern-looking in many respects - check out the elevated tails of the Plateosaurus and the active running posture of the Procompsognathus. It's in the mid-Jurassic where things start getting a bit more recognisably Dino Dark Ages. Of course, both the megalosaur and stegosaur look very active. 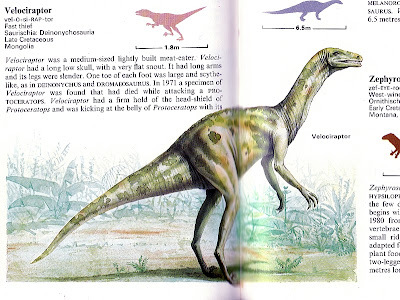 However, the Megalosaurus - in a typical, Neave Parker-esque skulking mode - looks rather strange, with very thin legs and adorable, humanoid arms and hands. The Dacentrurus shouldn't even be there, being as it was a Late Jurassic dinosaur. Still, for the early 1980s it's not bad at all, and at least the dinosaurs - even the tail-dragging Cetiosaurus tramping merrily by in the background - look like very mobile, exciting animals. 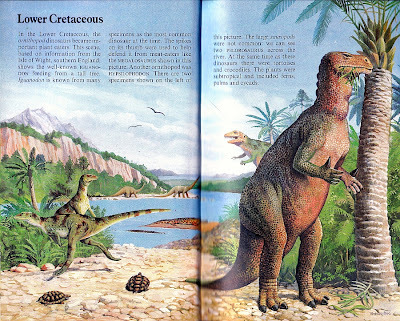 Weirdly, it seems like the further forward in time one goes in these illustrations, the more the dinosaurs devolve into 1950s-looking fatties. The slug-like Stegosaurus is particularly awkward, as is the round, thin-necked thunderthighs Apatosaurus. The Ornitholestes skipping merrily along on the beach provides an amusing contrast, though - like it's on holiday from a Bakker book. "Hey guys, just passing through! Enjoy your swamps, losers!" Man-in-suit Iguanodon alert! Actually, this one's completely overshadowed by the very distractingly hilarious peek-a-boo Anachronistic Cretaceous Megalosaurid™ (with five cute widdle fingers) sticking out from behind. It didn't scan particularly well but trust me - it looks like a cheap glove puppet. Come on Bernard, you're better than that! He could've at least given it a string of sausages or a truncheon. I'm being mean, though. Nobody's perfect, and the vast majority of Robinson's work remains very beautiful. 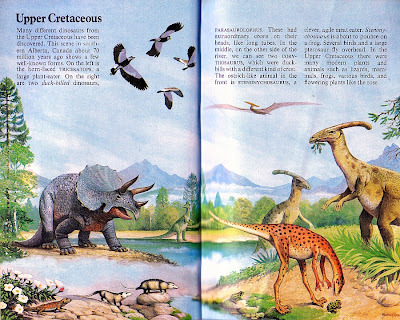 Although most of the dinosaurs in the Late Cretaceous scene below look very odd by today's standards (webbed hadrosaur hands...yee-ikes), at least some of them - the little pied fellas up there at the top of the page - are absolutely stunning. The composition of this scene is also very effective, giving a good impression of the vast size of some of the animals, especially Triceratops. Unless you see it in a museum on a regular basis it's easy to forget just how big Triceratops really was, and this illustration provides an excellent perspective. What of the non-Robinson stuff, then? Well, it's mostly pretty boring, and I'm not aware of who the illustrators were for each piece. However, there are some real gems. 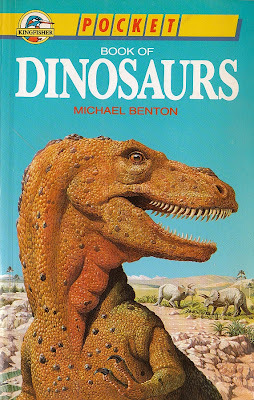 It seems that no 1980s dinosaur book is complete without a strange, strange ankylosaur, and here's one in the finest no-neck, stumpy-legged, short-tailed tradition. Love that head. 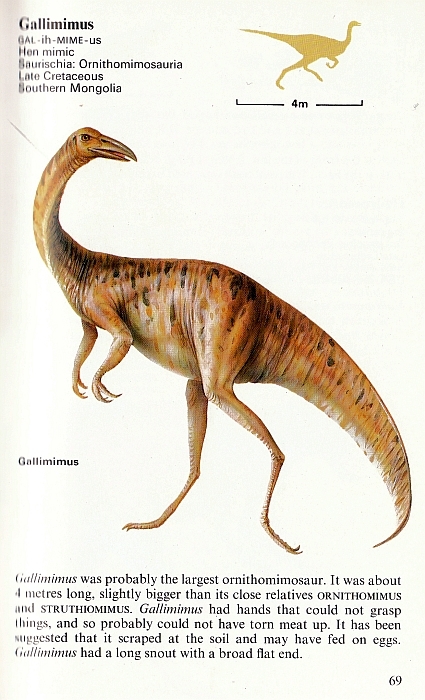 And...Galli-what-in-holy-hell-is-this-o-mimus. The pencil-thin legs! The very deep, laterally compressed tail! That BEAK! Amazing. 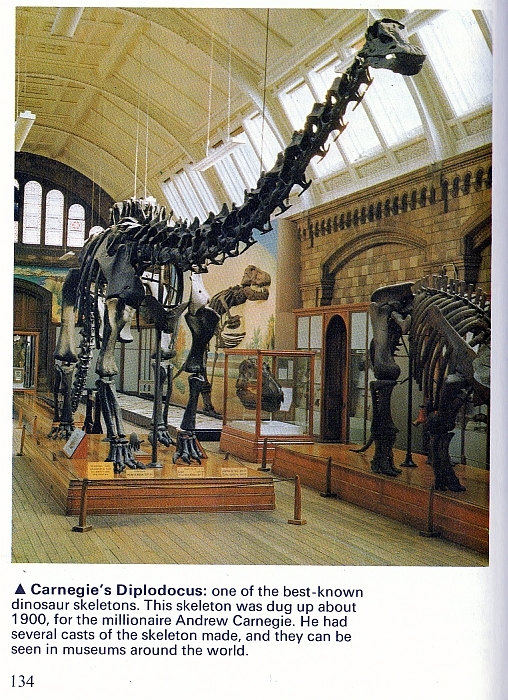 And finally: here's a very interesting photo of the Natural History Museum (London)'s dinosaur gallery, from a time before the Diplodocus was moved to the main hall (long, looong ago - but do let me know if you remember it that way. I'd be very interested, although I might refer to you as 'grandad' from now on). The Triceratops, stage right, has subsequently been moved into the main hall and then back into the dinosaur gallery. Meanwhile, the half-a-Tyrannosaurus in the background has been dismantled and is presumably in storage, except for its mandible; Darren Naish blogged about it once, and a very fascinating read that was. It seems like the Natural History Museum went for a cool, moody atmosphere when they opened their 'new' dino gallery in the early '90s and, as such, it's really bloody dark in there. I kinda wish it was a bit more like it used to be, for the ease of photography and examination. But then, I'm just never happy. 'Til next time! The World of Dinosaurs is illustrated by Hungarian artist Victor Ambrus, and in contrast to some of the more polished books we've featured here, it's messy and expressive, giving the book a distinctly savage tone. Ambrus is one of the select few artists featured in this series to warrant his own wikipedia entry, and is featured as an illustrator for the BBC4 series Time Team. Said team is not, I'm afraid, made up of scrappy youngsters in colorful apparel having kooky adventures in time travel. But I'm sure it's still a crackin' good show. Anyhoo: The World of Dinosaurs! 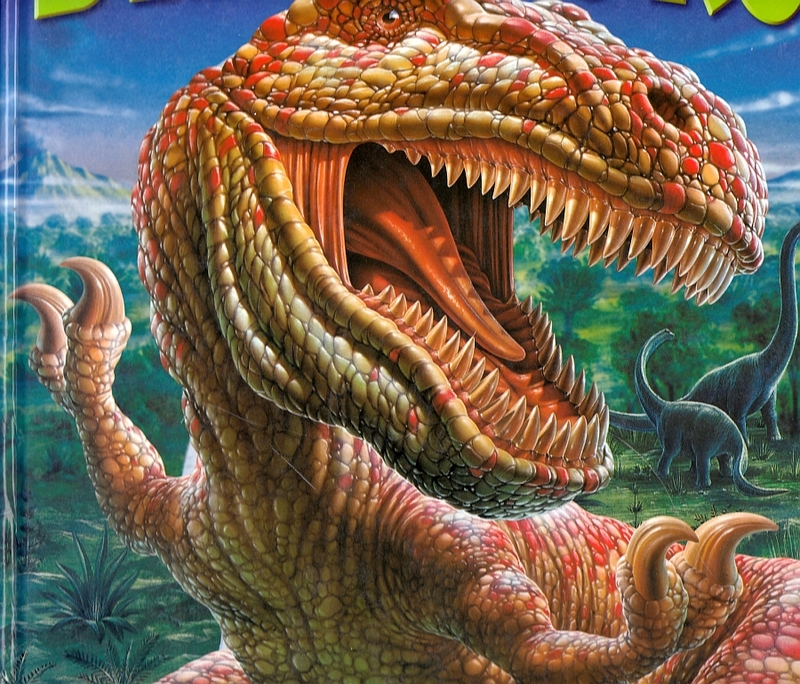 The cover advertises up front that this isn't some candy-coated stroll down Mesozoic Boulevard: this is a brutal realm where allosaurs have the cajones to dare a frontal assault on sauropods which greatly outweigh them. My favorite paleoart meme is back! Ambrus offers his own take on the bird-hunting Ornitholestes. Again, his refusal to trace old Zallinger, Knight, and Burian poses earns big kudos. His Deinonychus, on the other hand, hews closely to the iconic portrayal Bakker brought us in the late sixties, with its high-steppin' gait. 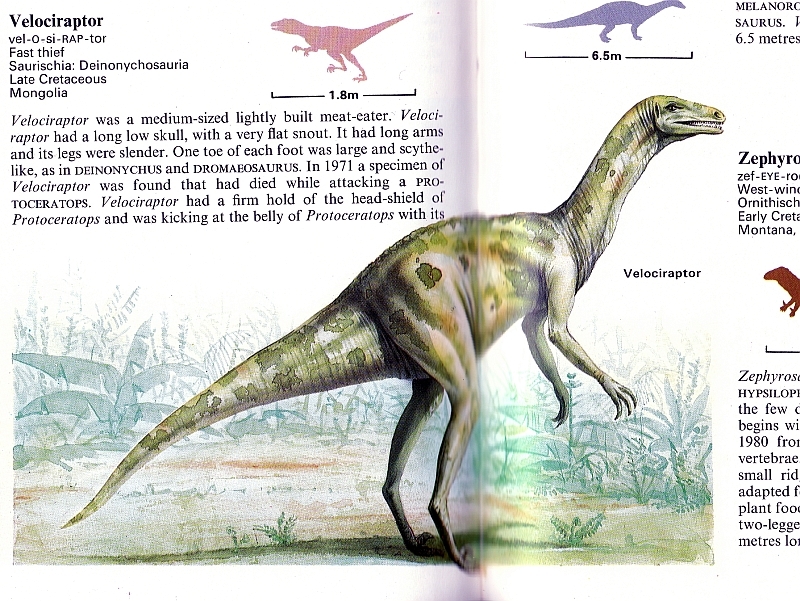 The book came out in 1976, hot on the heels of the Deinonychus description and just as the Dinosaur Renaissance was stepping on the gas. Tyrannosaurus and Triceratops square off again, natch. I've run out of things to say about this face-off. 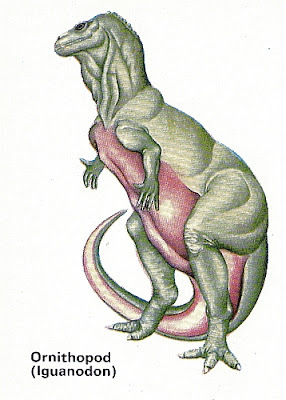 My favorite image is this Parasaurolophus, dripping with personality. This may not have been what it would have been like to happen upon a hadrosaur in the Cretaceous, but it's too cool to simply stamp "inaccurate" on it and forget it. Terry writes that the scans he's shared don't do justice to the book, and recommends tracking down a copy if possible. It's definitely one I'd like to add to my collection. Thanks for sharing it, Terry! * Yes, I own a pair of slacks reserved solely for the scanning of obscure dinosaur books. Of course I do. 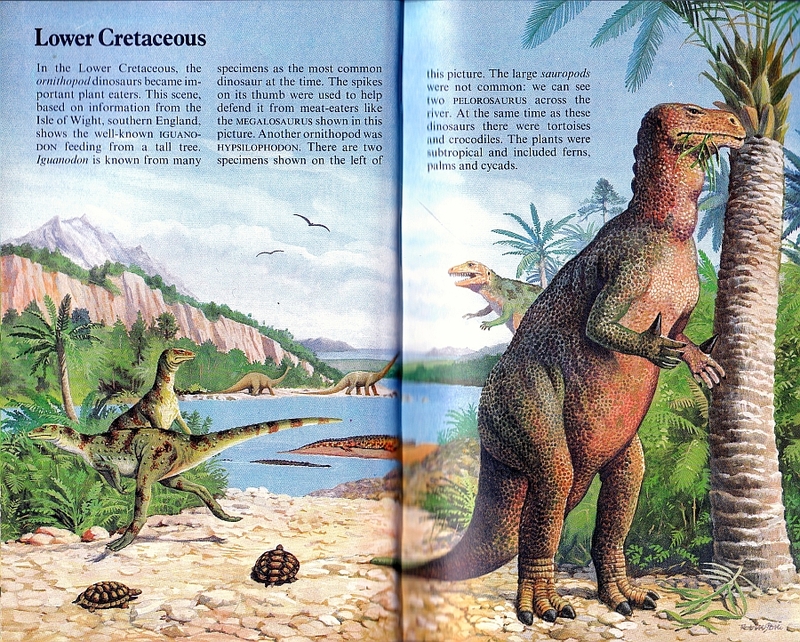 A book I recently stumbled upon while browsing Flickr is this week's feature in Vintage Dinosaur Art. Published in the 1880's (dates vary with either 1887 or 1889 being likely years of publication), Sea and Land is one of many natural history books written by J.W. Buel, who also wrote a number of adventure books cashing in on the hunger for the exotic so prevalent in that era. The engravings, shared by Steve Lew, are a mixed bag of science and superstition. 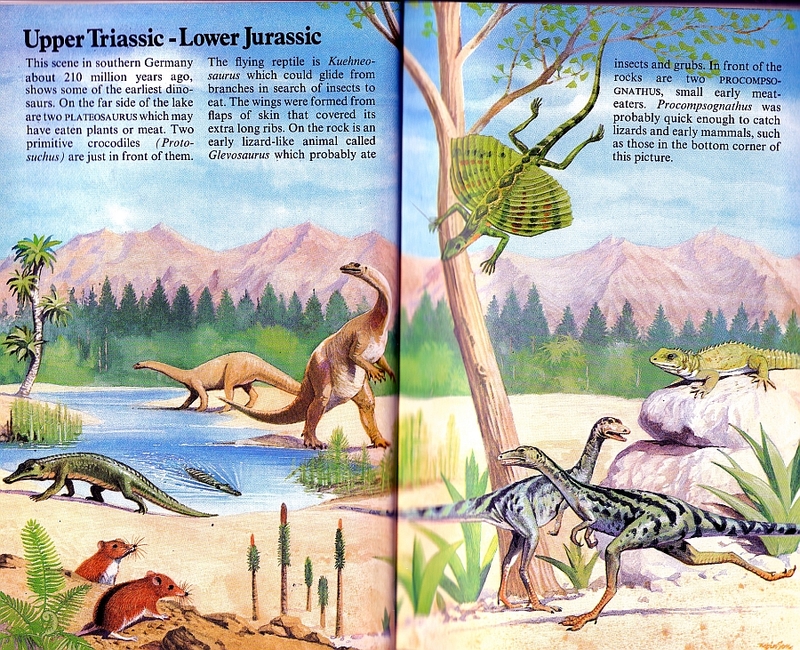 Included here are the Mesozoic-related plates, but there is plenty more fun stuff to check out. I said a mixed bag of science and superstition, and to show what I meant, here's one of the dubious claims: that of early humans squaring off against plesiosaurs. It's a silly, cartoonish thing to imagine a plesiosaur doing. About as silly: a plesiosaur striking out at a passing pterosaur and catching it on the wing. Blowhole-sporting ichtyhosaur included for additional fun. The plesiosaur gets it in the end, however. Luckily for us, all of this action is taking place above the water's surface, which is where sea creatures tend to settle their disputes. Of course, they all got it in the end, don't they? Here, the denizens of the Western Interior Seaway share their last flailing moments of life together. Since the text is not available, I'm left to imagine that Buel is supposing that the seaway literally dried up suddenly, stranding the wretched fauna to die agonizing deaths. 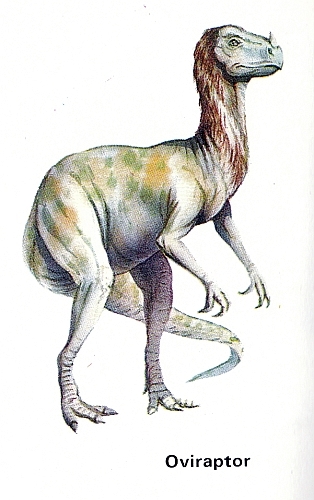 Here's a Rhamphorynchus we've seen before, in a last year's post about Victor Meunier. About time to get to the actual dinosaurs. There aren't many, but we get this take on Megalosaurus and Iguanodon, betraying a loyalty to an older vision of the Mesozoic as displayed at the Crystal Palace. This may also be ganked from an earlier source, as by the time of this title's publication, the Bernissart Iguanodons had jettisoned the old quadrupedal, spike-nosed version. Finally, we head back to North America to see the early vision of the Mesozoic uncovered by early American paleontologists such as Leidy, Marsh, and Cope. 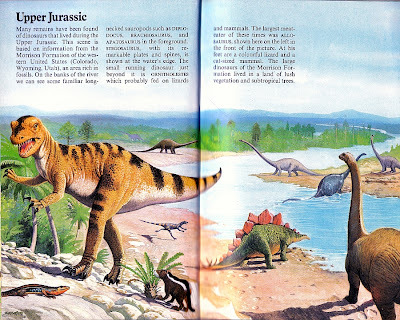 The illustration is titled "The Hadrosaur and Contemporary Animals," one of which may well be Dryptosaurus, making this yet another early depiction. I'd love to confirm this from the text, but it doesn't seem to be available anywhere online, so this remains a mere guess. Sorry for anyone who saw this in its incomplete state - I accidentally pressed "publish" instead of "save" earlier, also accounting for the hurried nature of the writing. 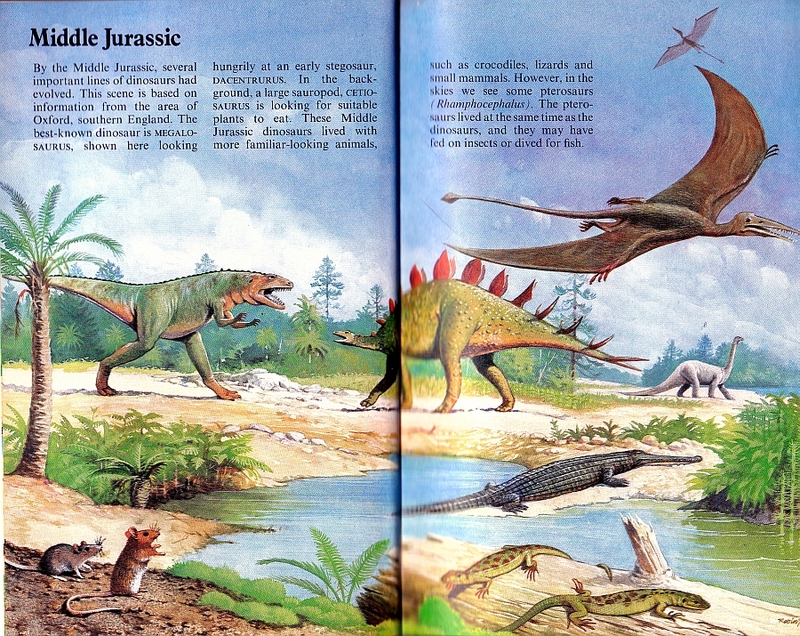 As always, please feel free to submit art from old dinosaur books to our Flickr Group.